At the moment it's cheaper than it has ever been to get a game to market. There was a time when it was just as cheap to make a game - one guy could thrash out a game in a few months on the good old Spectrum - but to get the thing in the mitts of the mighty public you had to get tapes or discs duplicated, and you had to send them out, plus all kinds of other cost and faff. Nowadays the download infrastructures of the iPhone and Android platforms take a huge amount of risk out of the venture. Even if no one likes your latest masterverk, at least you're not sat on 500 copies of Horrace Sells Badly. Even better, you can patch it and hopefully save it from the indignity of forever residing in the long tail. It's this effortless distribution that means so many of us can be independent developers at the moment. It's a great time to be making games, in fact, it might actually be the golden age of making games. I've certainly never had it so good. I feel sorry for the larger studios, for they might be independent but they still have a lot of hoops to jump through when working with publishers. And these hoops often amount to about as much fun as emphysema for the developers shouldering the burden. There was a time when these talented folk had little choice but to continue with their impressions of Atlas (I think I might be overcooking this a little) and stay within the fold. But now the power lies with the person with the talent. The latest of my former colleagues to enter the sea of independence is Antony Blackett (you may know him from such great games as Shatter and Flick Kick), with his newly incorporated company Rocket Jump. I have no idea what he's planning to make. In fact, it would appear from his website that neither does he. But it will be awesome, I can assure you. 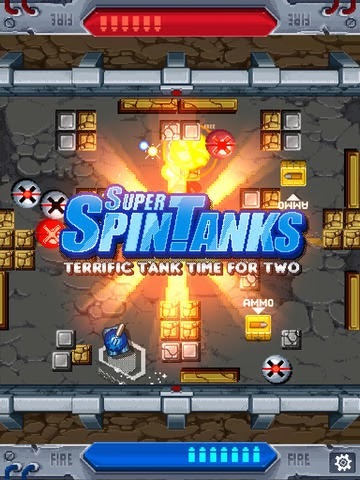 Get Super Spin Tanks for your iPhone or iPad! Alien Avian Attack! - Buy It! Hot Damn - It Lives!